With more job opportunities, Southeast’s Cyber Security program expands, and now has sixty-five students. The job market for cyber security experts continues to grow, and so does Southeast Missouri State University’s program in this field. 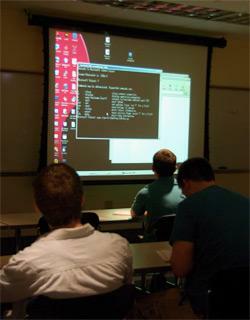 The university admitted its first cyber security students last fall. Currently, the program has approximately 65 students. The university expects the major will grow and projects 150-200 students by the end of next year. Dr. Vijay Anand is an Assistant Professor of Cyber Security. He says the field will continue to grow. “Cyber security is the first to protect, or have, the framework to protect digital assets and as companies are, as everyone is moving towards the digital world, cyber security is going to keep on growing from here on onward, because security for our digital assets is extremely important,” Anand said. Throughout the program, students are introduced to different operating systems, high assurance systems, forensic security, information security, and different hardware and software concepts. Dr. Anand said students can expect a lot from the program. “The students can expect this program to be a very comprehensive program. It covers all aspects of cyber security with a legal and ethical framework,” Anand said. In order to be admitted into the program, students should have high technology skill levels. Students must also complete courses in mathematics, science, computer science, and networking.